I have found myself saying lately that my husband Bruce is “on fire.” And though he is indeed a lover of all things pyrotechnic, in this case I’m referring to his overflowing ideas and unstoppable creation of artistic work as a sculptor. Both of us have been in a place of major career shifts in the last several months, and Bruce has been in reflection rather than creation mode. Recently, though, he crossed a threshold, and it is such a pleasure to see his eyes sparkle, hear his enthusiasm each evening as he talks about his progress, and watch his energy expand. The hallmark shift is that he can now easily enter a space of deep concentration and productivity, and I have been in awe of his ability to focus on tasks for hours on end. We all know these experiences – either micro or macro periods of time when everything around us ceases to exist and we become fully immersed in what we are doing. We can thank psychologist Mihaly Csikszentmihalyi for coining the term “flow” to describe this state, and for discovering through his research that flow is an experience shared by all—people of all ages and across all cultures. Flow is it is an aspect of being human. A big HOWEVER is that for many of us, the standard conditions of our lives don’t support us in achieving a state of flow. There are endless options and distractions that cause us to lose focus, and thus we end up with fewer opportunities to experience the pleasure, delight, creativity, and quality of presence that flow brings. The good news is that we can create the conditions for flow. But it requires knowing what the conditions are and making an intentional commitment to them. This has really mattered to me, because though I’ve found myself with no shortage of fascinating work to do, I’ve been struggling to sink into flow the way Bruce has. It’s not disinterest or work avoidance that is the problem; instead the multiplicity of projects, the freedom to take them in a lot of different directions, and the overabundance of information are part of what has kept me from entering flow. 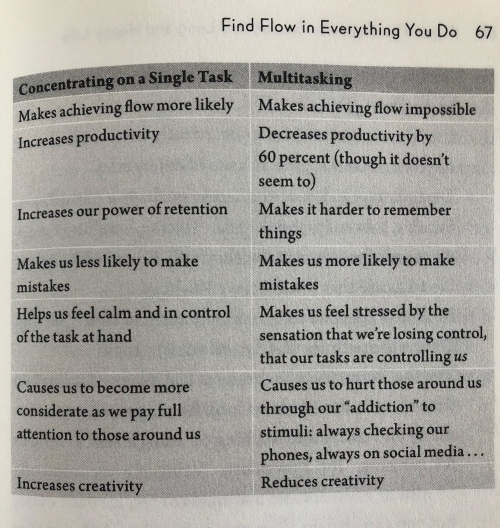 So, after digging in to this topic, I have landed on actively practicing three recommendations, best captured in the chapter “Find Flow in Everything You Do,” from Ikigai (see below). These steps have supported me greatly in achieving a state of flow lately; perhaps they will aid you as well. 1. Choose a challenging task. For me, this means worthy work, but work I’ve found myself putting off because I haven’t “felt like” doing it or I’ve told myself I didn’t have adequate time to dig into. Something about it is a little daunting. 2. Give yourself a clear, concrete objective for the time you have allotted. The amount of time isn’t as important as the goal. You can find flow on a micro or more macro scale; the trick is to be clear about what you want to accomplish given a certain window of time. Lots of research backs up the importance of having goals. The reality is that it’s not habitual for many people to set small goals for themselves throughout a day when they're working alone; teams are generally better than individuals at establishing short-term goals. Learning to set small goals is really a practice within the practice. By trying this again and again, one thing I am discovering is that it not only helps me achieve flow, but it also helps me improve my gauge of what I’m capable of within a certain amount of time. It is sooooo hard not to let the many-headed monster of distraction undermine us. I doubt I’m alone in this being the toughest part of the practice. Csikszentmihalyi’s research shows that in order to focus, two conditions are necessary. First, we have to be in a distraction-free environment. So, find a physical space that allows for this to be true, and then turn off anything that sends you notifications. The second condition is fascinating: we have to have control over what we’re doing in every moment. Not difficult if you have autonomy. However, if you are a parent, a teacher, or a supervisor, consider how you can empower others to focus by giving them control of what they’re doing for an uninterrupted period of time. So what's the reference to "catching the wave?" That takes us to body surfing, which provides a perfect closing metaphor for finding flow. 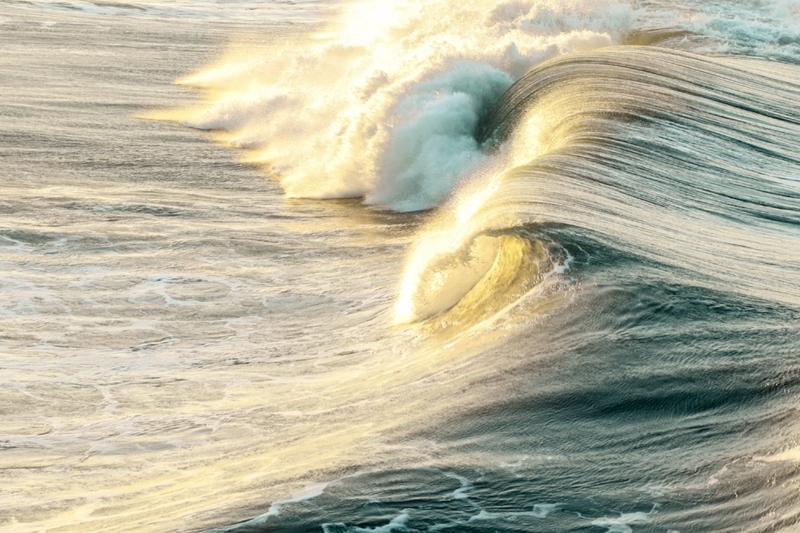 In a recent conversation with a coaching client, she was expressing a desire to do more than “go with the flow.” Instead, her aim is to "catch the wave." Less experienced body surfers bob in the water, rising and falling for a long time while awaiting the “just right” wave (consider waiting until you "feel like" doing something), whereas more experienced body surfers very intentionally catch a wave. They watch carefully, lay their bodies out horizontally as the directionally right wave approaches for where they want to go, and paddle like mad while taking the ride. The meaningful work you’re doing in the world deserves your flow, and you deserve the delight and creativity of it. Create the conditions for flow, and enjoy catching the wave! Ikigai: The Japanese Secret to a Long and Happy Life, Hector Garcia and Francesc Morales, 2017.